Small businesses, including agribusinesses, can sometimes be better off negotiating with their customers or suppliers as a group (referred to as collective bargaining). Working together, you might be able to negotiate better terms and conditions with larger businesses, and create efficiencies, that you could not achieve on your own. However, without ACCC approval prior to commencing negotiations, collective bargaining risks breaching the Competition and Consumer Act 2010 (the Act). 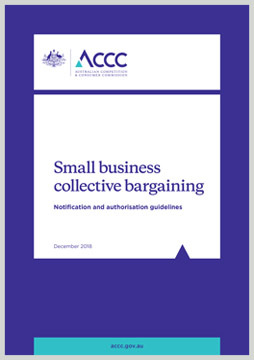 This guide provides information on the collective bargaining approval processes in the Act and outlines how the ACCC assesses the public benefits and detriments associated with collective bargaining proposals.